Edited by shizzle01, 25 April 2011 - 06:40 PM. Trying to make a new script now...must test first! Important: the encryption password is needed to open the encrypted disk drives"
*edit* Oh dear, I made a mistake all the time, now in (x86) folder! Still: No dcrypt folder directory to be found! Edited by shizzle01, 25 April 2011 - 06:59 PM. Ok, I just went through all the folders (except bootmgr ) with the commands I learned on YouTube, but I didn't find anything DiskCryptor related?! Ok I didn't check for hidden files in every folder, but yeah, shouldn't be hidden, or? There must be an issue with WinBuilder! Please see my attached log! Try with the attached modded script. Diskcryptor should be in X:\Program Files now. Ok, al_jo was right, it's all under Y:\ (more specifically: Y:\Programs\DiskCryptor\dcrypt.exe), which is my DVD burner, i.e. the burnt image! But now what the hell is X:\ and why does it go there? And why can't I change my directory to Y:\ ? Every other (C:, E:) works, even though that doesn't help me... the encrypted partition seems to be D:\ ! Thanks to PE Shell Swapper I could check on all this Wonder why they don't show that first (before the command line). PS: Why again can't Win7PE not just load the normal Windows Installation routine?! Every tutorial tells me to go from there!! Edited by shizzle01, 25 April 2011 - 07:32 PM. And thanks again, I don't want to sound ungrateful. It's just I'm under quite some stress, b/c if I don't get this fixed tonight, I'll have to drive home tomorrow morning first thing and try my original DC rescue disk as a last resort. Or access my Acronis backups to get my stuff back on a new, external harddrive which I'll then have to emulate as system harddrive, as I can't take out my harddrives out of my laptop, because it's a non-standard, non-swapable SSD-RAID array built by Sony! Edited by shizzle01, 25 April 2011 - 07:35 PM. Thanks al_jo. I'm just burning your customized script on DVD. Here is the log of the creation in WinBuilder. Ok, looks good so far. Of course now you maybe won't be able or willing to help (sadly ), because now I'm stuck on the sucky DC command line commands. Which do not work. I tried to mount like described, but it doesn't even recognize the "dccon" command. *edit* I mean I'm assuming I don't have to load the dcrypt.exe, or do I? I did try it and there I see the normal DC GUI! Does this mean I can just go from here and maybe the whole description from here is maybe just plain outdated? Seems no one here used DiskCryptor yet? Edited by shizzle01, 25 April 2011 - 08:22 PM. Yes. Cool, so it is there. How do I get there?? And why again can't I get there by using the command line? As said I'm new to WinBuilder, had no time yet to "enjoy" it, at the moment I want to just reach my goal first..
Edited by shizzle01, 25 April 2011 - 09:00 PM. What I'm confused about: now with the "new" build, it always only loads into the "PE Shell Swapper" and I find no way to get out? (Into the usual start screen of WinBuilder...) Now I'm there..
Edited by shizzle01, 25 April 2011 - 09:08 PM. I actually (only on the 2nd try successfully) installed the boot thingy of DC on a USB stick from your DVD/build. Works. But then it doesn't load/boot of course(??) another time, but loads into the broken Windows, so nothing gained..? Next, how would you proceed SPECIFICALLY, i.e. transition from mounted SSD to Windows repair? I actually successfully mounted D:\ with the DC script GUI (! ), but even then it isn't accessible!!!? Why? So I couldn't look into it either, nor did the Windows CD recognize it, as I did the highly illogical/weird step of removing the Win7PE DVD and reinserting the original DvD to start the setup.exe. But then windows gives an error message, stating it doesn't recognize ANY harddrive!! ...why is there no normal Windows 7 DVD file system structure on the Win7PE DVD ?? I thought all the programs were just an addition, but this looks like a big mess, missing the setup.exe? O.o No wonder the Win7PE DVD doesn't start into install/repair mode, but the PE Shell. Why does it do that? Or did I maybe do sth. wrong when compiling the WB ISO? It is all very confusing! By the way, yeah, I had & have no rescue CD here, god knows why! maybe I'll reencrypt & then pay closer attention to this! Meh...would love to get some feedback from actual DC users, hope you are warned now about the risks! Absolutely horrifying days these were..
Ok, this is too much for me! I did try Startup repair & as described in other forums, it doesn't recognize. Still it hangs/freezes in every possible option I can try from "safe mode". How can this be so badly programmed?? Is there any way to FORCE Windows to do the stupid "Upgrade"/Repair? I actually wanted to do a filesystem repair now, but I can't change the driveletter with "cd" both in the "Windows" and the "PE Shell" commandline ! ...what?!.. Why not start from the beginning? With one issue at the time, ok? Do you really have a bootable CD/USB now that works? 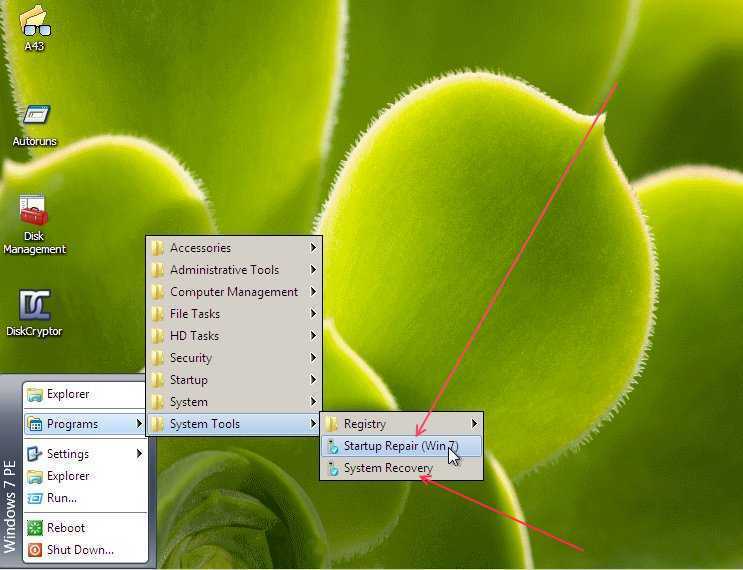 extract, start winbuilder.exe, point to your source and click run! Burn the ISO, start the PC with the burned CD. If that works, come back and report, ok? Ps. Don't change anything concerning the scripts! I don't know what you consider bootable. I can boot into the windows DVD or the choice screen of safe mode or into the named WinPE interface. I don't even have a working PC here, sorry. I also don't understand the goal? I explained that the "usual" (GUI) repair doesn't work, so now the only option is chkdsk /f. Sorry, I meant a bootable Win7PE on cd/usb of course. I'm getting creative. I tried to open cmd.exe via the PE Shell Swapper GUI under \Windows\System32. Sadly tough, yet again another error: "ifsutil.dll is missing"! What now? I have no idea how to get it there (where? ), and sure it's not on the Win7PE disk either?...awesome.. Ok, I got chkdsk running (/f and /r) both didn't help! As this is more of a Windows (7) support topic now, could maybe some of the mods better move it there? Thanks! Just my two cents. Recently I have slightly changed Disk Cryptor script from olegpov. I needed a better PXE and AVX compatibility, available in new 1.0 beta releases only. And I didn't need XP compatibility, so it won't work with that OS. Anyway, we talk about Win7PE here, isn't it? You can take my version here. There are both sets of files, for x86 and x64. Unfortunately, ntldr hasn't provided zip files of 1.0 betas so we cannot check authencity of that files by any hash. And if you don't trust me (and it is reasonable, of course), you can download an installer to make setup procedure on x86 and x64 systems to check them by yourself. (The installer is smart enough to extract different files according to an architecture of specific system). I used the latest beta version 735, available here. There is RunFromRam Boolean variable which determine that. If it is TRUE, Dcrypt folder will pe placed in X:Program Files (and packed inside install.wim). If it is FALSE, Dcrypt folder will pe placed as outside programm in Program folder on CD. Could be changed from script's UI, by the way. Edited by 0sten, 30 January 2012 - 10:56 AM.